Ok been awhile since I've done an art/painting Blog update. This is the newest piece from my art studio. Its a commission piece for Steady Clothing. I've been asked to sit in at there booth this week at Magic in Las Vegas. I thought it would be cool to have a nifty card to hand out and sign. I wanted to keep with Steady's over all feel and style. 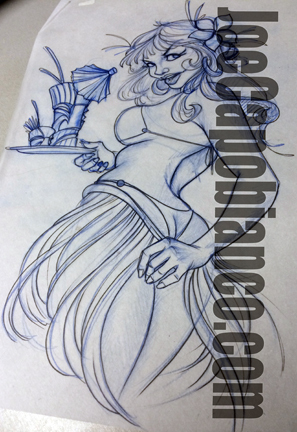 So I decided on a Tiki piece, and what better way to pull that off than a Hula Capo Gal. I dropped all of my base color tones in with Copic, and Prismacolor markers, and went right in with acrylics and airbrush. I tried something a bit different for a surface. Working with a toned water color paper, vs my normal, toned strathmore paper. I liked it for the markers. Very little bleed. But I feel when it came to paint I think that you get better paint coverage, and workability on a gessoed surface. So gonna work on this technique some more. This was all a pretty last minute deal. As the image had to be conceptualized, approved, painted, and sent to print in about 6 days. That on top of other projects, and a very busy tattoo schedule made for some crazy afternoons. Over all I dig her. Like I said she'll be debuted at Magic Tuesday March 18th in the Steady Clothing Booth. I'll also be making her available as part of my Mini Print line in the coming months. So keep an eye peeled for that.